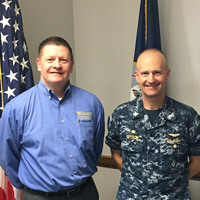 Joey Edwards, director of Webster University's Memphis NSA Mid-South military campus location, recently spent a day “shadowing” the NSA Mid-South commanding officer Capt. David Bryson as part of Edwards' participation in the Leadership Millington 2016/2017 class. Edwards' day included time spent one-on-one with Capt. Bryson, learning about his responsibilities as the commanding officer (CO), the required tasks of each of the base commands, and their importance to the U.S. Navy. A tour of the base included a Thanksgiving lunch with the children at the Child Development Center. Bryson is a strong advocate of education, and the time spent with him built on an already strong relationship between NSA Mid-South and Webster University. Leadership Millington is a leadership program for community members sponsored by the Millington Chamber of Commerce, which includes a day touring NSA Mid-South.